When: Thursday, Oct. 26 • 6-8 p.m.
Where: Decatur Recreation Center, 231 Sycamore St.
You are invited to attend the first public workshop to help kick off preparation of Decatur’s Community Transportation Plan (CTP) Update. Beginning in October, the city will conduct public workshops to identify various mobility needs and to take a deep look at the state of mobility in Decatur. We want to hear from those who work, live, and recreate in the community. All participants are encouraged to bring their ambitious goals to the kick-off and other input opportunities. Input opportunities are designed to be easy, informative and fun for everyone to discuss the future of all modes of transportation, identify current and future needs, make short- and long-term recommendations, and develop a vision for new mobility options and improvements throughout the city. Public input is a large part of the Decatur’s CTP Update. Through this plan, we want to address the equity, sustainability, and active living community goals in Decatur’s 2010 Strategic Plan, as well as build off the framework of Decatur’s 2007 CTP: Decatur Gets Around. Decatur has hired the professional consultant team of jB+a, a division of Barge Waggoner Sumner and Cannon, Inc., and Toole Design Group to assist in the plan update. Stay informed on the CTP Update by watching the city’s website and future issues of the Decatur Focus for project information and meeting announcements. For more information, contact Angela Threadgill, 678-553-6575, or angela.threadgill@decaturga.com, or visit DecaturNext.com. Are you interested in learning more about the City’s FY17-18 budget? There are a few ways for you to get involved between now and adoption day on June 19, 2017. Take some time to read through the budget document. It’s available online at www.decaturga.com/budget. Or if you prefer to look at a hard copy, head over to the Decatur Library reference desk (215 Sycamore Street) or stop by the City Clerk’s Office (509 N. McDonough Street) to check one out. Let us know your thoughts via the Open City Hall forum. If attending a meeting at City Hall just doesn’t work for you, you can still let the City Commission know your thoughts by sharing them here. Watch the archived video of the City Commission work session focused on the FY16-17 revised budget and the FY17-18 proposed budget. An archived video of the session is now available on the City’s website. Decatur will launch its first Open Office Hour with Mayor Patti Garrett on Monday, March 27 from 7 – 8 p.m. The Mayor will speak for approximately 15-20 minutes on the topic of Decatur’s commitment to being a just, welcoming, equitable, inclusive and compassionate city and the activities and efforts around that commitment. The community is invited to tune in to watch and listen and will be able and encouraged to submit questions related to the topic live via Twitter, Facebook, email, or phone. Do you have a question relating to this topic that you would like for her to answer? Visit http://www.decaturga.com/whats-new/open-city-hall to submit your questions. Audio is now available on the City of Decatur website of the Lifelong Community Advisory Board’s information session on the Homestead Exemptions that will be on the November 8 ballot. City Manager Peggy Merriss, City Schools of Decatur Superintendent Dr. David Dude, and City Schools of Decatur Board Chair Annie Caiola were on the panel. The talk was moderated by Lifelong Community Advisory Board member Maria Pinkelton. Special thanks to Lifelong Community Advisory Board member Elizabeth Burbridge for recording the talk. We apologize that the audio is a little grainy at the beginning but it gets better. Please be certain to listen for at least the first 15 minutes and you will get a good summary. Visit the City Schools of Decatur website for more in depth information. Also, visit the City website for information regarding Homestead Exemptions currently available. If you would like more information about the Lifelong Community Advisory Board and its committees (Taxation and Affordability, Transportation, Housing, Decatur Neighbors, and Communication), please email leeann.harvey@decaturga.com or call 678-553-6548. Decatur’s Lifelong Community Advisory Board’s Taxation and Affordability Committee is hosting a Third Thursday information session for City of Decatur residents to learn more about the new homestead exemptions that will come up for vote on the November 8 ballot. Please join us on Thursday, October 20, 6:30 p.m., at Decatur Recreation Center, 231 Sycamore Street, to learn more about the exemptions. A panel from City Schools of Decatur and City of Decatur will answer questions and provide information about these five homestead exemptions. One of them is an exemption from school property taxes for homeowners over the age of 65—an exemption that expires in five years when it will be re-evaluated. For more information about the Decatur for a Lifetime initiative or the board, contact leeann.harvey@decaturga.com or 678-553-6548. The Decatur City Commission will hold a work session on Thursday, June 2, 2016 from 3:00 p.m. to 6:00 p.m. to discuss challenges and opportunities in the FY16-17 proposed budget and FY15-16 revised budget. The work session will be held in the City Commission Meeting Room at Decatur City Hall, 509 N. McDonough Street and is open to the public. The work session will also be available for viewing online at https://www.decaturga.com/city-government/city-commission/streaming-video. Lifelong Decatur Presents: How Do I Get There? Decatur Recreation Center, 231 Sycamore St.
Where do you want to go? Find out about the many transportation alternatives for getting around when you can’t or don’t want to drive, bike or walk. Some options are ones we take for granted, such as Marta. There are also many more creative options from local nonprofit organizations and universities. Decatur’s Lifelong Community Advisory Board invites you to discover what is currently available and encourages you to offer suggestions for other options that you would like to see in the future. For more information about Lifelong Decatur and the board, contact leeann.harvey@decaturga.com or 678-553-6548. 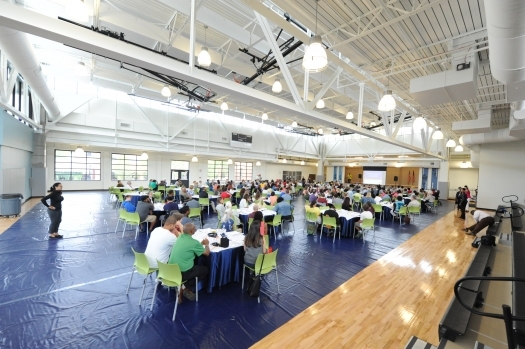 A full recap with photos of Saturday’s Better Together kickoff is posted on DecaturNext.com. If you were unable to join the conversation on Aug. 29, there are many more ways to participate and make your voice heard. The community survey is still open and can be filled out anytime you have an internet connection (for hard copies of the survey to share with those who are not online please come by the Community & Economic Development Department of City Hall, 509 N. McDonough St.). There is a conversation toolkit to help you or your organization host a conversation this month (the deadline for submitting information from your group discussion is Oct. 3). On social media, use #BTDecatur to share photos and reflections from your experience on Aug. 29 or from any of September’s smaller conversations. The DeKalb County Tax Assessor’s office will be mailing annual assessment notices to property owners beginning tomorrow, Friday, May 29. These notices communicate 2015 property values set by DeKalb County for residential and commercial property. Based on reports from the DeKalb County Appraiser’s Office, the total value of property within the City of Decatur increased 20% over last year’s total property value. Thirty percent of the increase is due to new property being added to the tax digest. The remainder is due to revaluation of existing properties. This increase is consistent with residential sales data for the City of Decatur as well as increases in property values in other cities within DeKalb County. The assessment notice will include information on how to appeal the county’s determination of property value. There are specific deadlines associated with the process so please look for more information about the property appraisal process on the DeKalb County website . We encourage you to review the appeal information and to file an appeal if you believe the value established by the county is not correct. In response to the increase in property values, the Decatur City Commission is considering a one mill decrease in the millage rate. The revenue from property taxes supports the city’s budget, which funds operations such as sidewalk maintenance and construction, community parks and playgrounds, and police and fire services. The City of Decatur budget for the next year has been presented to the City Commission and they will be asked to vote on the budget at their meeting on Monday, June 15. Public hearings on the millage rate and budget are scheduled for Monday, June 1 at 7:30 p.m., Monday, June 8 at 6:00 p.m., and Monday, June 15 at 7:30 p.m. All hearings will be held at Decatur City Hall, 509 N. McDonough Street. The budget is available for review on www.decaturga.com/budget, at Decatur City Hall and at the Decatur Library. Superior Ave Water Main community meeting THURS. Thursday, May 28, 6:30 p.m.